Are you having trouble in accessing SSS Online Inquiry? If yes, then this article might be the answer. 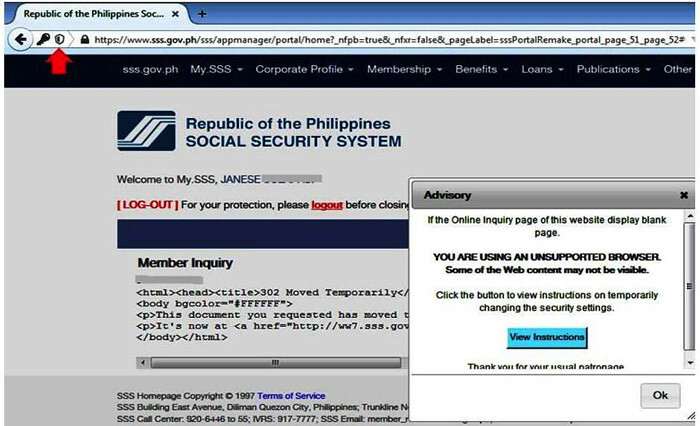 Most of the SSS members complain that they cannot access their account online. The problem is, the SSS website has a supported browser where you can easily open your account and most of the users don’t use this browser. To make it easy for you, I’m preparing an easy to follow steps with screenshots for you to possibly access “Online Inquiry” in SSS website using unsupported browsers. But make sure first that your SSS account is register online, you can follow this instruction how to register for SSS account online. My.SSS can be accessed anytime and anywhere provided that you have Internet access and a compatible browser. Yes, SSS Website is best viewed using Internet Explorer. But how about using browsers like Google Chrome and Mozilla Firefox? It is possible to access using these unsupported browsers? Well, here are steps, just follow along. 1. Go to the SSS Website (https://www.sss.gov.ph/) log in to your account using your User ID and Password. 1. Click the shield button at the left of the address bar. See the screenshot. 2. Click the “options” button, then select “Disable Protection for Now”. Using Google Chrome – to be able to access the SSS online Inquiry using Chrome. 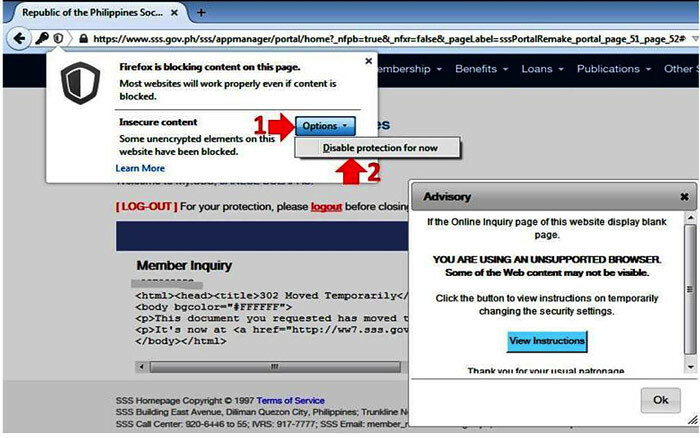 That’s it, you can now enjoy the full benefits of online services from SSS and don’t forget to close the pop up advisory before you proceed.